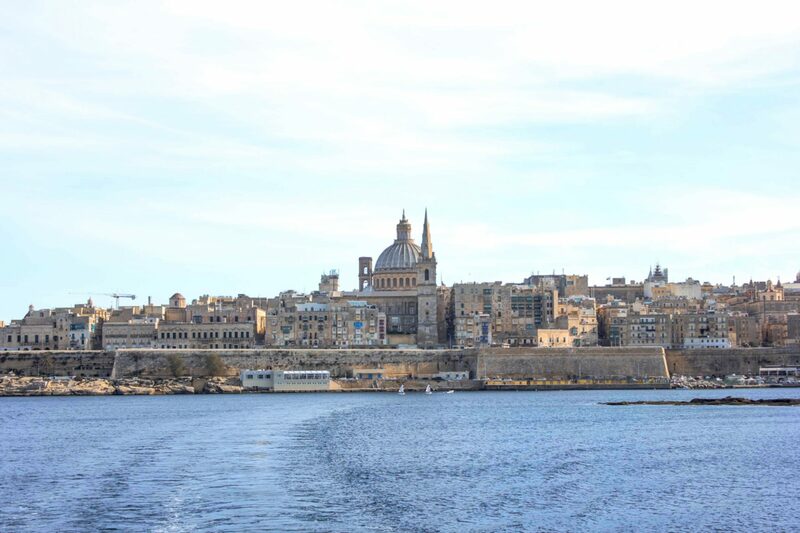 The Maltese capital of Valletta is world renowned for offering a melee of historical points of interest since its foundation by the Order of St. John in the 16th century. Check out our top five destinations in this great city as we explore the city's political, religious and maritime past! Commissioned by Grand Master Jean de la Cassière, the cathedral was built between 1573 and 1577 and is home to two masterpieces produced by the world-famous Italian artist Michelangelo Caravaggio. The cathedral’s interior was decorated in the Baroque style by Mattia Preti, amongst other artists, in the 17th century and is considered to be one of Europe’s finest living examples of this architectural style. Still an active church, the Cathedral has developed into one of Malta’s most popular tourist attractions. Opening hours are between 9:30 and 16:30 on weekdays and 09:30 and 12:30 on Saturdays, should you wish to visit this monument to Christian faith and architectural brilliance. Learn more on the cathedral on their website. Founded in the 16th century by the Order of St. John to defend the Valletta harbour from invasion, this monument to Malta’s maritime history and significant strategic position between mainland Europe and North Africa. 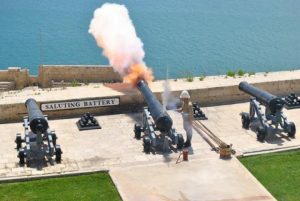 Following an extensive restoration process, the battery is once again operational with the cannons being fired daily at midday. The firing of the cannon once served the purpose of enabling the harbour’s ships to calibrate their chronographs on board but now serves as a nod to the city’s rich history. This is the oldest operational saluting battery in the world and is well worth experiencing on your trip to the capital! Find out more about the battery from their website! The Grandmaster’s Palace has played a central role in the island’s political structures since its construction in the late 16th century. Originally the palace of the Grand Master of the Order of St. John, the once ruler of Malta, the palace now houses the Office of the President of Malta (currently encumbered by Joseph Muscat). Whilst elements of the palace are closed to the public, the Palace State Rooms and the Palace Armoury are open to the public to exhibit the island’s political history. The Palace State Rooms play home to a number of immense artistic representations of the island’s history, including the beautiful 18th century French tapestry “Les Teintures des Indes” and “the Great Siege of 1565”, as painted by Matteo Perez d’Aleccio. If history and art are your thing, you cannot afford to miss a trip to the Palace during your time in Malta. Check out the Palace, as viewed by drone, in the video below! Find out more on the Grandmaster's Palace on their website. This fort is a great attraction for visitors looking to explore the war-time history of the Maltese islands. Fort Saint Elmo most famous moment came during the Great Siege of Malta in 1565, where it was the scene of some of the most intense fighting following an invasion from the Ottoman Empire. The fort withheld the siege for 28 days before eventually falling to the invaders. However, it played a key role in enabling the reinforcement of troops from Spain and for domestic forces to prepare another two fortresses to withstand the Ottoman invasion. The fort plays host to re-enactments of historic events, providing the perfect venue for little ones to indulge in an imaginary world of knights and dames of times gone past. Whilst the fort was previously listed as one of the world’s most endangered sites of heritage, extensive restoration work has been undertaken to protect Upper Saint Elmo and the Carafa enceinte and secure the future of this iconic location. If you would like to learn more about Fort Saint Elmo then head over to the Heritage Malta website. One of the more sombre monuments to Malta’s history, the Siege Bell memorial is a beautiful place of reflection in memory of the island’s valiant resolve in the face of an onslaught of 3,000 bombing raids from Italian and Nazi air forces between 1940 and 1942. Designed by world renowned sculpture Michael Sandle, the monument was cast in 1992 and instigated by the George Cross Island Association in commemoration of the 50th anniversary of the Maltese people receiving its collective George Cross (adorned proudly upon the nation’s flag). This monument to Maltese resilience sits in the Castille bastion of the Lower Barakka Gardens and is well worth a visit for those wishing to pay respect to the island’s important contribution to the fight against fascism during World War Two.